Typically I wait until night (often very late at night…) before blogging because I want to see what all happens in my day before discussing just one thing, but today is different. I love being different. I think I’ve always known I’ve been different. I love my life. I love being involved in a ton. I love working on new ideas. I love each of my passions and interests. I don’t love bing asked to choose just one. I’m pretty bad at making decisions. I’ve discussed this on multiple blog posts of mine (Making Decisions, Uncomfortable Moments) and most people that know me well understand how true this is. I even did an entire post called “Who Do I Want to Be?” which is entirely about how I never know how to answer the question “Who is your hero?” because I admire so many people that I can’t decide on just one. This post then goes on to talk about what my friends (including teachers/mentors) and I call the “Anya Problem/Dilemma,” which basically is the problem of being interested in too many things to the point where you can’t decide on just one path, so you get spread out really thin over a variety of topics. Other questions I can never answer include: What college do you want to go to? What do you want to major in? What do you want to do when you grow up? Who do you want to be? 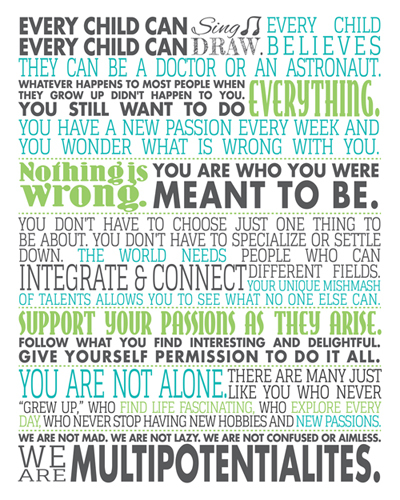 What’s your passion (singular passion…)? What’s your goal (singular again…)? What motivates you (you guessed it, singular too…)? I don’t know what I want to be when I grow up, and I never have, but that is okay because I am only 16. I understand the beauty of not knowing your specific passion because that allows you to experience life with an open mind to all fields of learning and growing. It’s not only that I can’t answer these questions, but they often make me anxious to be asked these questions. I remember last year probably being more stressed than any other time when being asked about what courses I want to take next year (this current school year). I wrote two different posts (What to Do? and What to Do: Part Two) that both went into my “Rants and Bugs” category that were all about my stress in trying to decide, because I have the opposite problem of most people where there are more classes I want to take then time that I have in my schedule to take them. I feel as if I’m constantly being pushed to make decisions and decide on one path, and then I don’t feel as if I fit on that one path which just makes me frustrated. It sometimes gets to the point where I feel confused because friends of mine don’t seem to be having these same problems. I’d say over the past year these situations have been occurring more often with the college discussions becoming more frequent. I haven’t grown to be okay with it, but I’ve been tolerating it; trying to play along. Today I watched a TEDTalk called, “Why some of us don’t have one true calling,” that might have possibly been the most moving TEDTalk I’ve personally watched, because Emilie Wapnick introduced me to a world of people just like me having these same problems. These people are called “multipotentialites”, and I can’t even begin to explain how great it was to hear this TEDTalk! Words can do such a great job of bringing communities together. In drama we always hear our director say before every show, “Don’t lean back, but lean forward as you watch the MVPS Allstars production of…” He says this because when an audience is leaning forward that means they are really invested and interested in what you’re saying, and they are hanging onto every word wanting craving to hear more. I was leaning forward the entire time I listened to this TEDTalk. Like I said at the beginning of this post, “I love being different. I think I’ve always known I’ve been different.” However, sometimes- oftentimes- it is hard being different. Everyone is different thought, it is just a matter of how we are each different and unique. Wapnick made me feel proud to be a multipotentialite rather than feeling frustrated about not being able to make decisions on singular things. Her website even has tips for multipotentialites on how to make a business out of all of their different curiosities. However, the question I keep wondering is about what to do before then. I’m still in high school, unlike most of the people who have commented on twitter or her website about being a multipotentialite. Most of these people have graduated college and are now realizing they don’t feel quite right about the current job position they are in and what to make a change. I don’t want to remain confused and frustrated about my multiple interests until after college. One (there are more of course) of the biggest driving forces as to why I do what I do is that I believe people of all ages have a voice and can contribute to real world problem solving. Part of why I don’t like the question, “What do you want to be when you grow up?” is because I don’t think I should have to wait in order to do something and be someone. All of life matters. Not just your life following college. So with being a multipotentialite that has a ton of curiosities that drive my learning, how do I shape my current path to avoid maximum frustration and confusion? How might I create a college experience that doesn’t focus on making me choose one path as a specialist, but allows me to continue to explore where my curiosities take me as a multipotentialite? What a wonderful story. What a wondrous wander of a walkabout you are taking. Take wing!